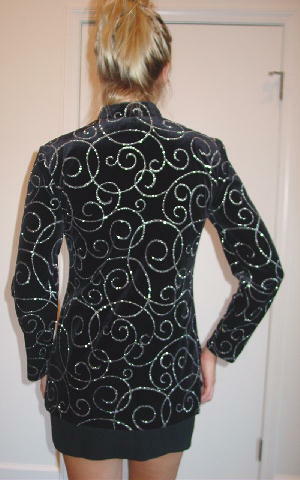 This long black velvet evening jacket is 90% polyester and 10% spandex and is by J.B.S. Ltd. There is a swirl line design in silver glitter. 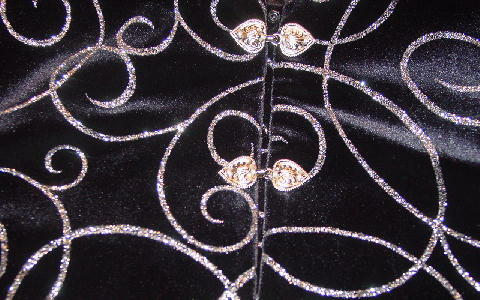 It has five metal silver-tone sets of heart-shaped front closures. 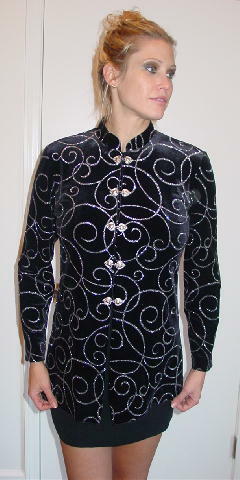 There is a 1 1/4" wide collar, long sleeves, and 6 1/4" long bottom side seam slits. It sparkles more in person. shoulder to hem 27 1/2"
bottom hem side to side 19 1/2"